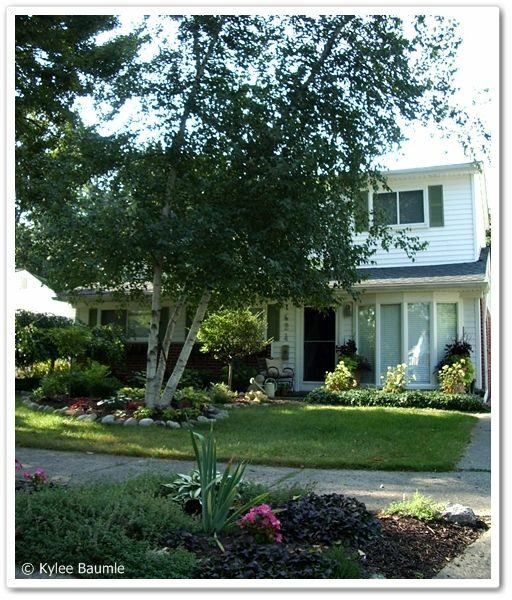 Last weekend, at the invitation of my Soil Sister Jan, I traveled to her home in Royal Oak, Michigan, a suburb of Detroit. It was a 2¾-hour trip - an easy one, right up 75. The weekend had been planned for more than a month and we looked forward to doing some fun things as well as some "work" regarding The Soil Sisters. When I first arrived, we snacked on crackers with tabouleh and hummus, both of which were a first for me. Then we got into the "Hoe-mobile" and headed to some local nurseries. What's a Hoe-mobile, you ask? Jan owns her own landscaping business called Two Women and a Hoe™ and her vehicle sports the name of her business on the side. Our first stop was Ray Wiegand's Nursery and Garden Center. WOW. Acres of green. Of course I found a few things I couldn't live without - Hakonechloa aurea 'All Gold', Carex muskingumensis 'Oehme', Carex hachijoensis 'Evergold', and Tricyrtis 'Samurai', 'Sinonome' and 'Amethystina'. I'm going to see if I can kill the 'Evergold' again. Yes, Marcella, I've killed a Carex! Then it was on to Wade Nursery. It was here that we saw the adorable topiaries of a flower and moon and stars. 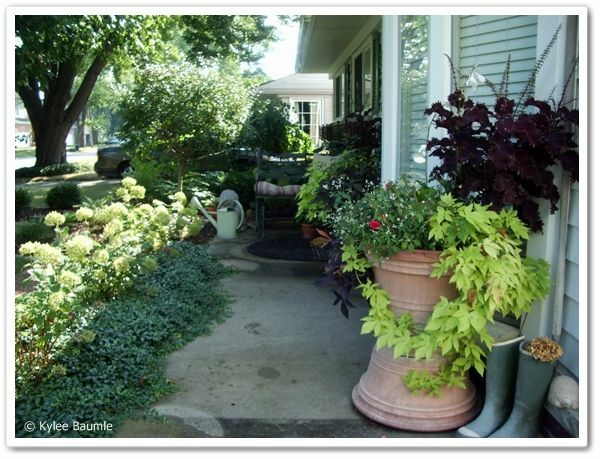 They wouldn't be for every garden, but we liked them all the same. 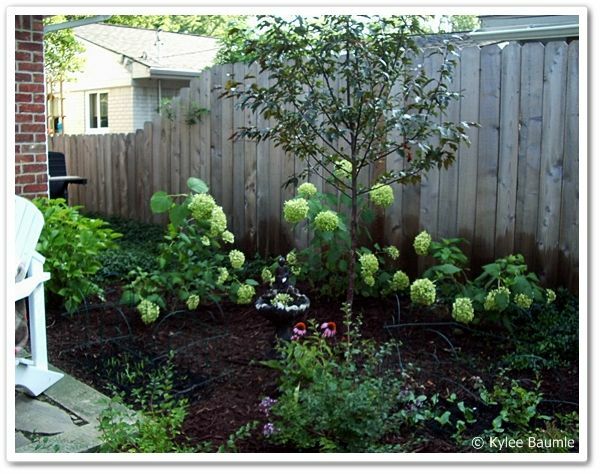 Here, I purchased a beautiful variegated elderberry shrub - Sambucus nigra 'Pulverulenta'. 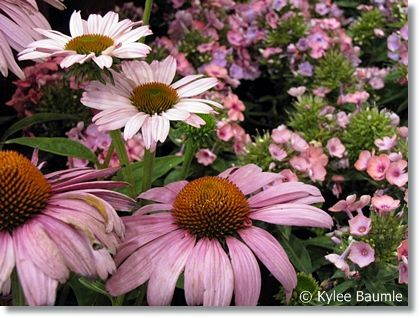 Our final stop was Deneweth's Garden Center, where I found a very nice Echinacea 'Hot Papaya'. I already have one of those, but it's small and this one was about three times its size for the same cost I paid earlier this spring. We had planned to visit Bordine's Nursery, but they'd closed for the day by the time we got there, so we'll save that one for another time. 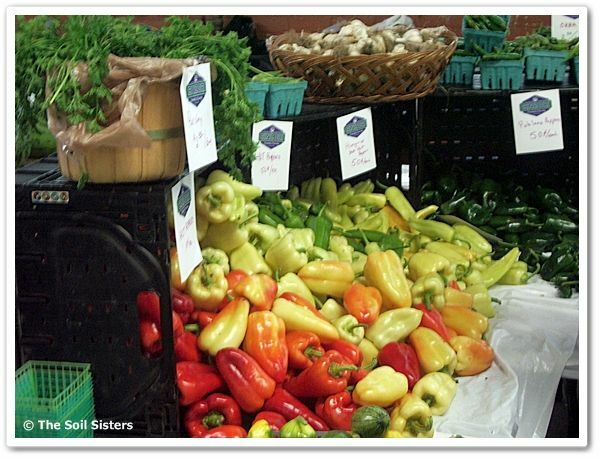 Brenda Haas has posted several times about her visits to Bordine's on her blog, BGgarden. It's huge and I'm sure it has more than one plant that may have found its way back to Ohio! 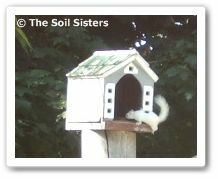 One of the things I hoped for during my weekend visit was to catch a glimpse of Edgar, the white squirrel. 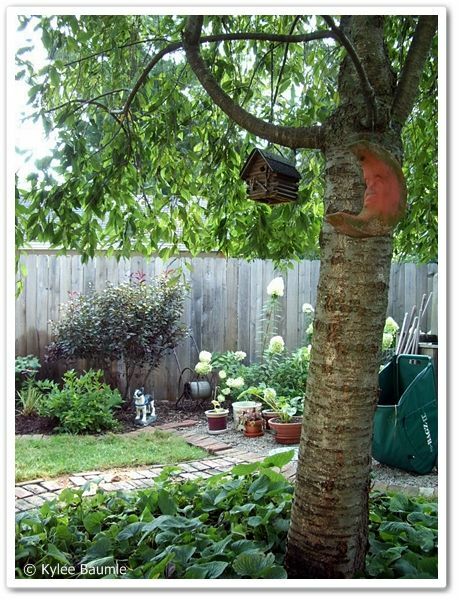 Jan has a small house placed atop a tall dead tree stump where she feeds Edgar peanut butter bread. He loves it and comes every day to eat it. But Edgar had not been seen for about four days and she was worried something happened to him. A neighbor said she'd seen him a couple of streets over, but couldn't be sure. 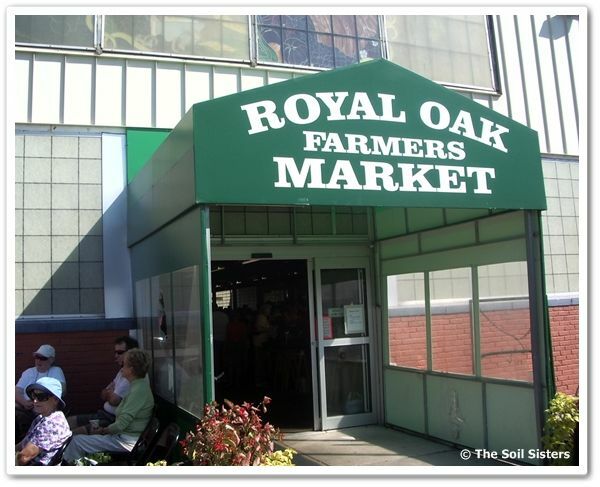 Saturday morning, Jan, her business employee Michele, and I headed over to the Royal Oak Farmers' Market, where we conducted a presentation for the public about various aspects of gardening. Generous sponsors contributed their products for a raffle that was held after the presentation. 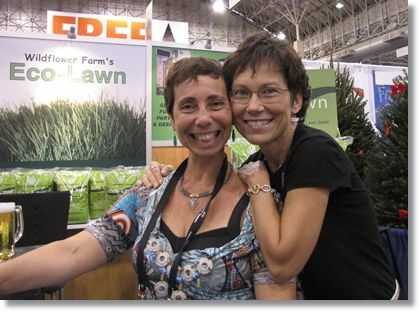 Thank you to: Annie of Authentic Haven Brand, for the compost tea; BBB Seeds for an assortment of garden seeds; Corona Tools for a pair of bypass pruners; Two Women and a Hoe™ for the organic personal care products. 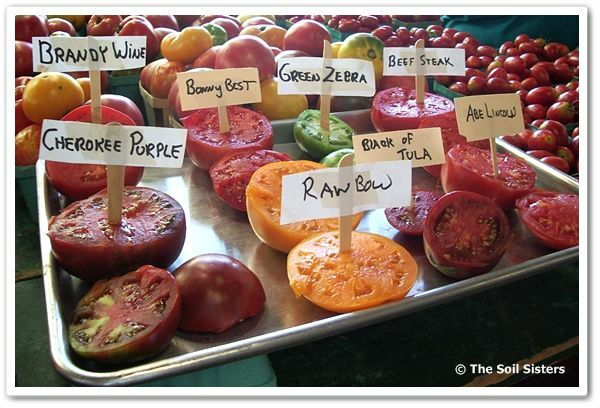 These are from a garden center in Ann Arbor - Hilltop Greenhouse & Farms. I found some beautiful perennials for $4 each! We had quite a bit of work to do for our Soil Sisters site, but we managed to have some fun the rest of the weekend, too. A few of Jan's friends came for dinner Saturday night (Salmon filets!) and we had a good ol' girlfriend gab session around the dinner table. 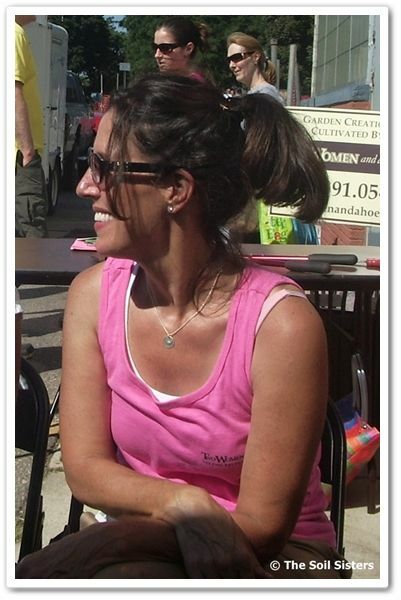 I love to learn from other women, because we all have so many different experiences to share. I decided to make a Texas Sheet Cake for dessert and while it wasn't finished before some had to leave, those that had it uttered sounds that let me know they liked it. No one in that house, except for me, had ever had it before! Sunday morning began with Jan excitedly announcing that Edgar had been spotted! It had been five days since he'd been around and while Jan feared he was gone, he had come home. 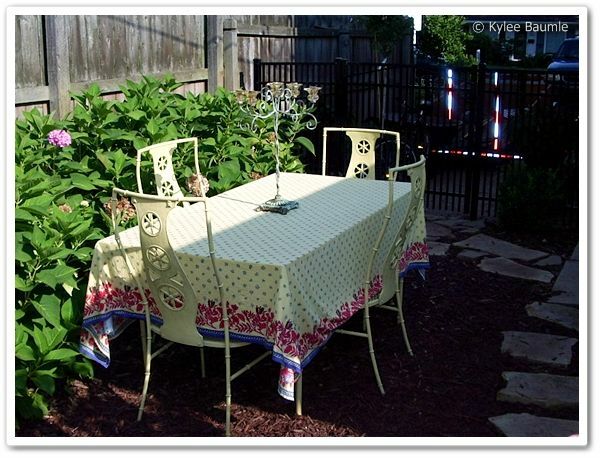 We sat out on her patio with our coffee and Diet Mountain Dew (my "coffee"), watching Edgar frolic in the treetops. Eventually, he returned to his house to retrieve the peanut butter covered slice of bread. Before I left for home, I again borrowed Jan's camera and took some photos of her beautiful gardens. 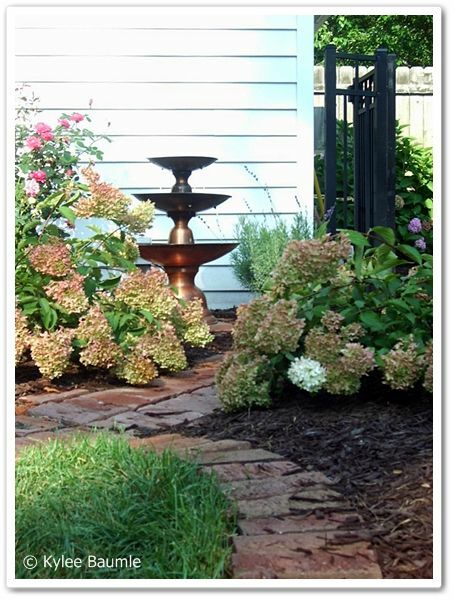 Jan is a talented landscape designer and sitting on her patio was relaxing and peaceful, surrounded by her beloved hydrangeas and supporting cast of plants and flowers. 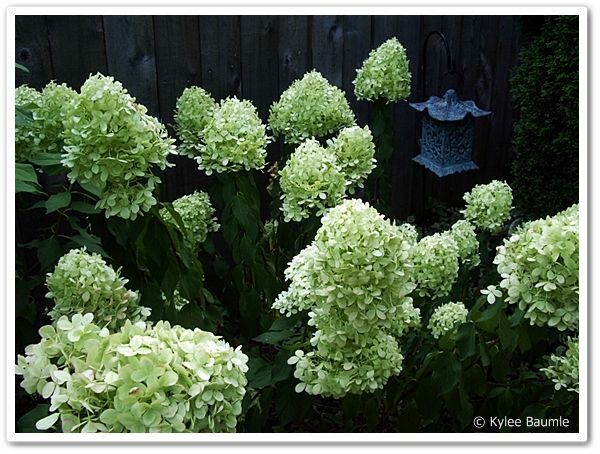 Jan's hydrangeas are nothing short of amazing! This is 'Limelight'. Thank you, Jan and Wally, for opening your home to me and making me feel like family. I hope you enjoyed having me as much as I enjoyed being there, because you haven't seen the last of me. I'll be back! Last week, Horticulture magazine unveiled their newly-redesigned website. I love Horticulture magazine. 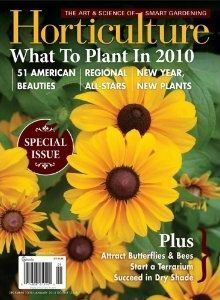 It was the first gardening magazine I ever read or subscribed to - in 2005, I believe. I've been a subscriber ever since. Your "first" is always special. 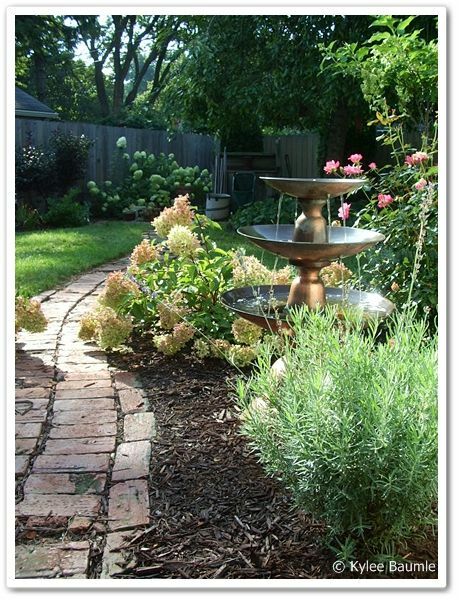 It appeals to the novice gardener, yet holds enough challenge for the advanced. I love that it's been in print since 1904. It has history. 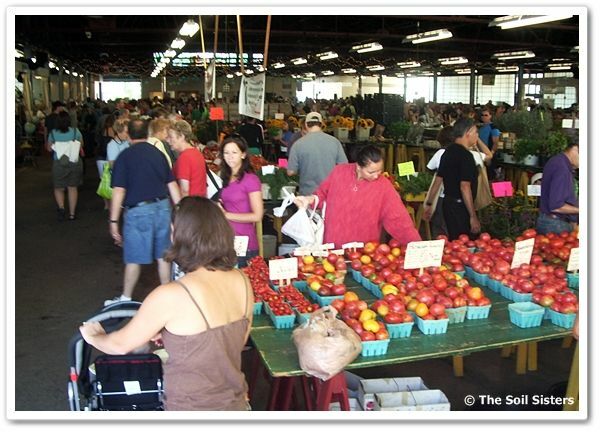 It's headquartered in my home state of Ohio, located just a couple of hours down the road in Cincinnati. I know a couple of people that work at Horticulture and I love their passion and love for what they do there. They offer DVDs for sale, containing all of the articles published since 1987. And now there's one more reason it's special (to me). Earlier this month, they named me the Book Review Editor. 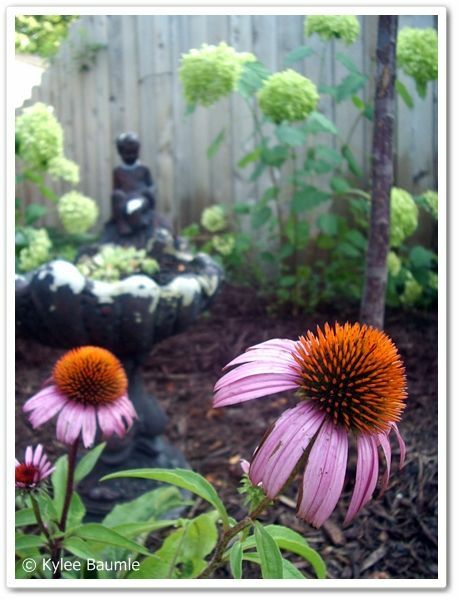 I'm absolutely delighted and thrilled to be doing garden book reviews for their site. You can find them here. 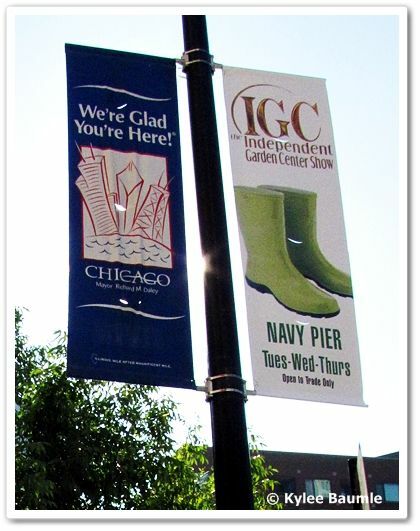 It's taken me some time to recover from the recent trip to the Independent Garden Center Show in Chicago, August 17-19. 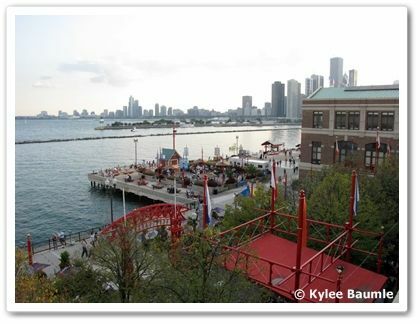 What a hub of activity there was at Navy Pier, where the show was held! 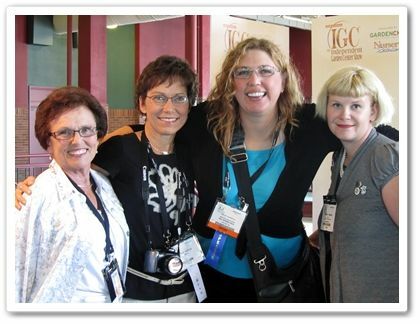 Mom and I got there about an hour before the trade show floor opened and had time to catch up with several friends. In fact, that was one of the best things about the show - the friends and acquaintances, both old and new. 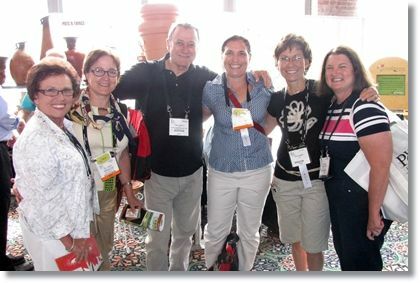 Over the last 3½ years I've been writing this blog and traveling here and there to garden events, I've met an amazing number of wonderful people. I've heard it said that gardeners are among the nicest people there are, and I believe it to be true. Once we were allowed into the exhibit hall, we methodically made our way around the floor, which held over 1000 vendors' displays. With this many vendors, it's clear that the event needs every minute of its three days to allow attendees to check things out! 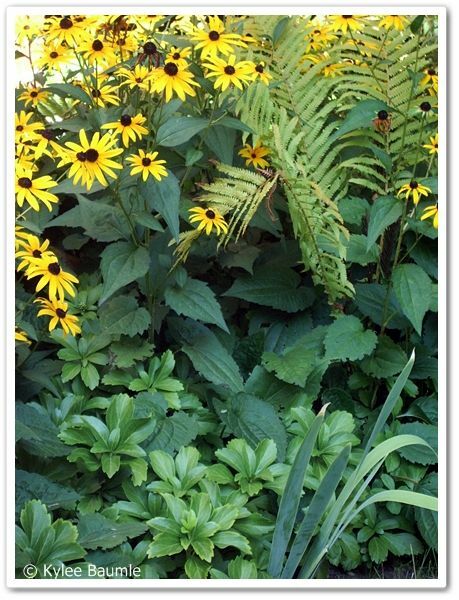 Shirley Bovshow had given me an assignment, along with Shawna Coronado and Mary Ann Newcomer, to pick two garden products that I particular found an interest in. 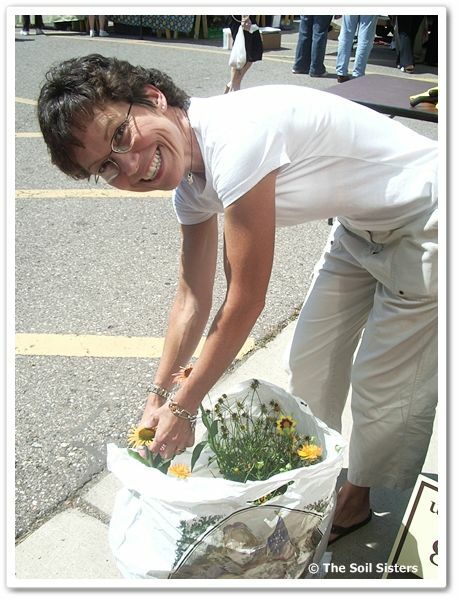 Shirley is the energetic host of Garden World Report, to which I'm a regular contributor. 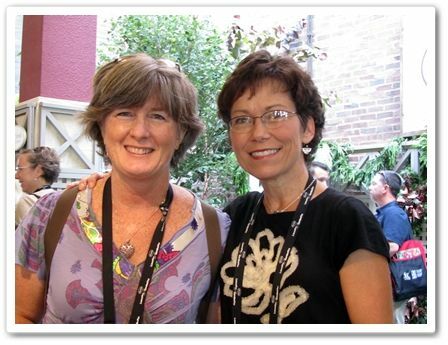 This was the first time I'd met Shirley in person and she was everything I expected - beautiful and full of the joy of life! I set to work, going up and down the aisles and stopping to investigate when something caught my eye. And my eyes were all over the place! 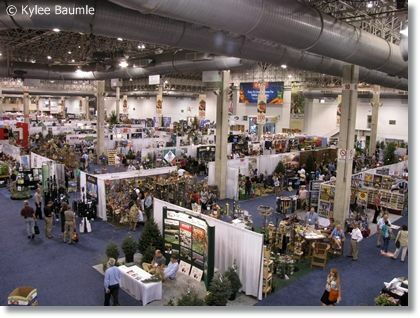 Seriously, if you've never been to a garden product trade show before, it's like putting a little kid in a candy store. Except that when you're a gardener, the "candy" looks like a hoe, a pot, a pruner, a sprinkler, a plant...oh, the plants! 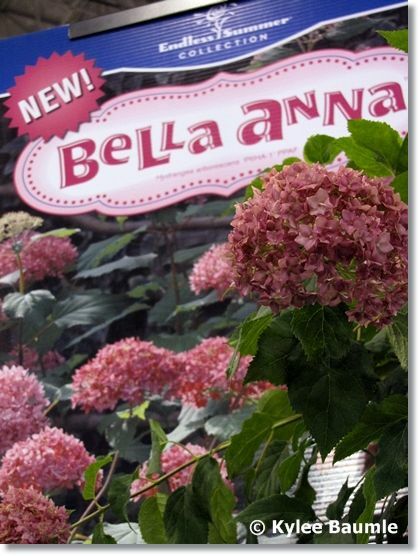 Having finally just purchased the third in the Endless Summer™ series of fabulous everblooming hydrangeas, 'Twist 'n Shout', I was excited to see the fourth - 'Bella Anna', which is a pink 'Annabelle'! And I got lucky enough to take one home! These will be available to the public next spring. 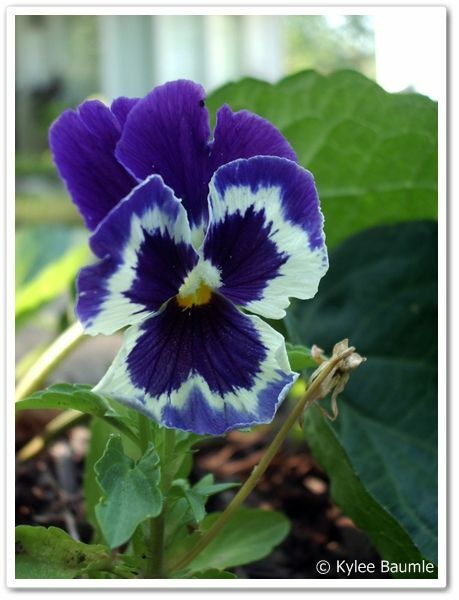 By getting to plant mine now, I'm hoping it will get settled in and will be all poised to perform well in 2011! 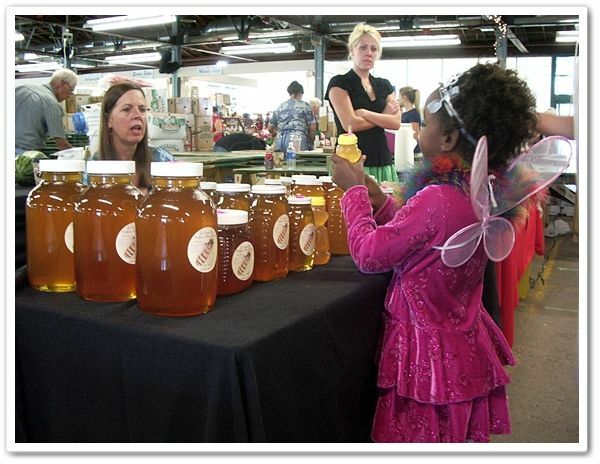 There were garden products that I stopped to check out and talk about with the vendors. A couple of different pruners came home with me, as well as a few hoes, a plant hanger, a cooling hat, seeds, gloves, easy connectors to make a trellis, an edger tool, an electronic watering meter, and a few other things. To be sent later are a Woolly Pocket, some hedge trimmers, a sprinkler, and a 3-in-1 trellis - all for testing and review here. With Jerry Peed, owner of H. Potter. One of my favorite vendors was H. Potter. I'd talked on the phone with Jerry Peed, the owner of the company, and I got to meet him at his booth. H. Potter carries beautiful Wardian cases (terrariums), trellises, cloches, bird feeders, and many other beautiful, original designs of art for the garden and home. Another high point of the show for me was getting to meet the people of Cool Springs Press. 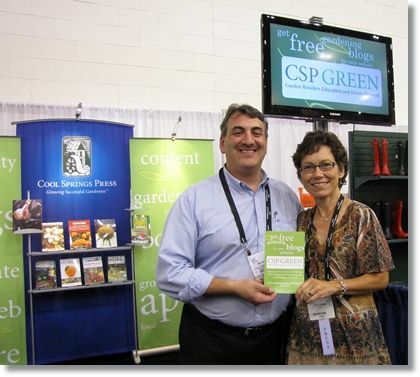 Since April, I have been an author for them, writing blog content for their CSP GREEN Program, for Independent Garden Centers. I've enjoyed working with several people that I finally got to meet at the show, including Jim Bashour, Billie Brownell, and the publisher, Roger Waynick. I'd already met Clint Albin in Buffalo at the Garden Bloggers' meet in July, but it was nice to get to see him again, too. 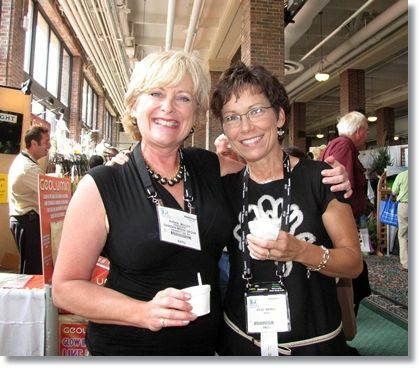 The first familiar face I saw when we arrived at the show was that of Julia Martz (Snarky Vegan). 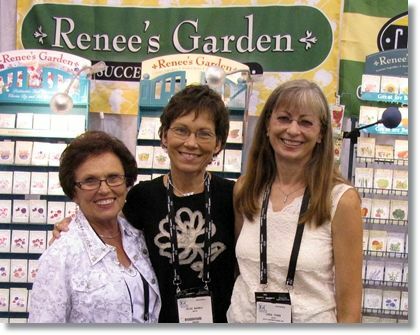 I met Nelly, on the left, and Renee Shepherd, on the right, owner of Renee's Garden Seeds. 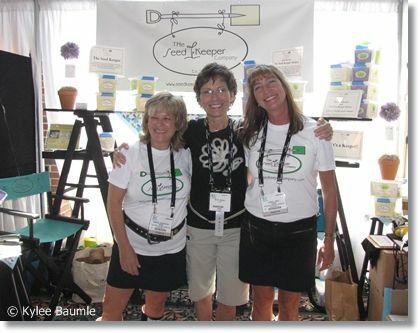 Renee is the one that supplied all the garden bloggers with Nasturtium 'Spitfire' for the Seed GROW Project. 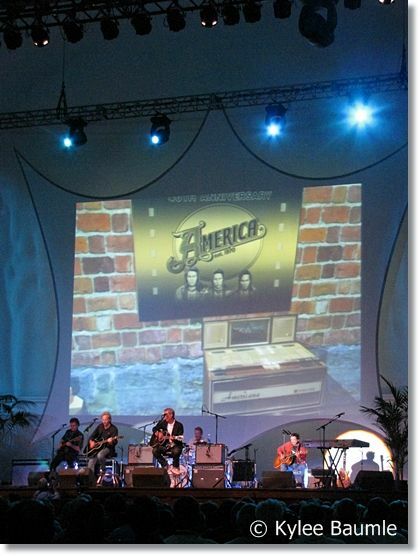 The first evening, we were treated to a fabulous concert by America, one of my favorite groups when I was in high school and college, and still love. What a treat to listen to them, still sounding as good as they did in the '70s. 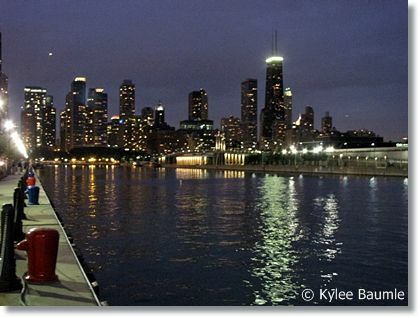 Mom and I stayed at Club Quarters Hotel on Wacker Drive at Michigan, which was about a mile from Navy Pier. 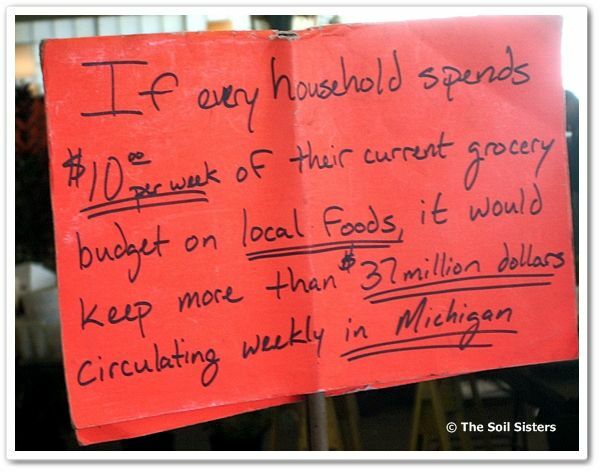 I'd bought a rolling cart for the show, learning from my experience at OFA Short Course in Columbus the month before. We left the concert and walked back to the hotel on a beautiful, warm summer night. 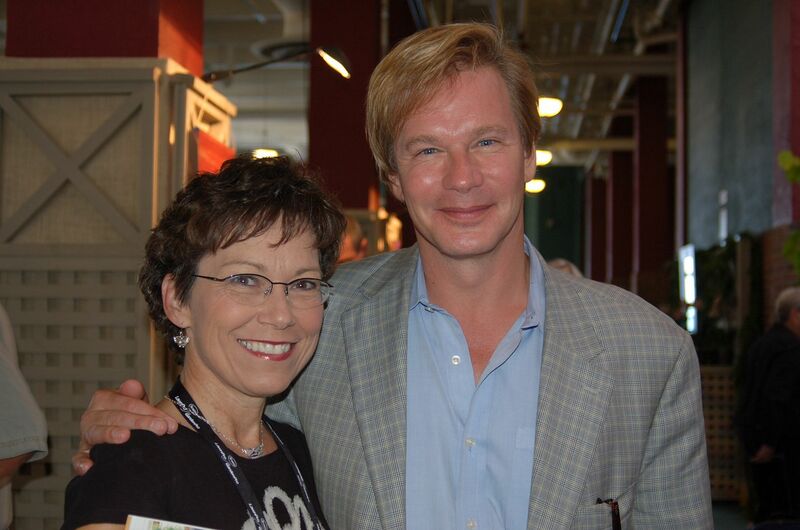 The next morning, we walked the mile back to Navy Pier and first stop of the day was to meet P. Allen Smith. 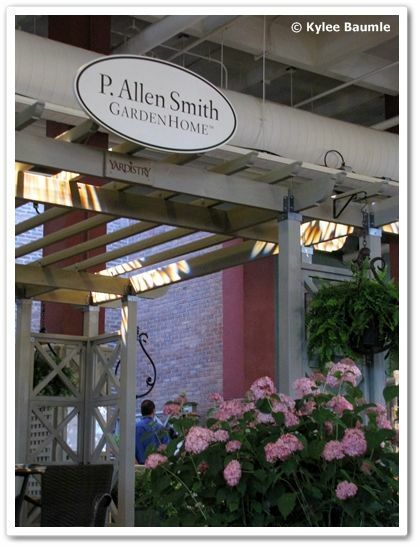 It was a popular stop for many, but he graciously greeted everyone and signed his new book (P. Allen Smith's Bringing the Garden Indoors: Containers, Crafts, and Bouquets for Every Room ) that they were giving away. I was fortunate to get one of the last copies! Shortly after that, Shirley Bovshow interviewed him for her show. 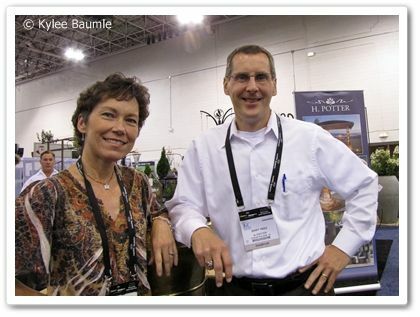 GardenHome showcased some of its Yardistry line of pergolas and other garden structures. 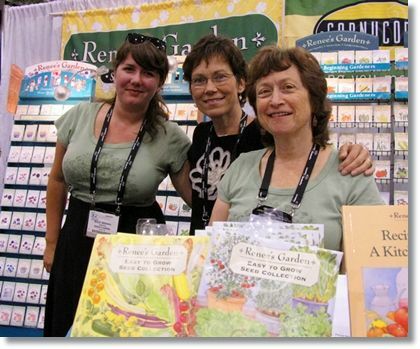 It was here that I ran into those fabulous "Good Enough Gardening" gals, Jean Ann Van Krevelen and Amanda Thomsen. They wanted to do a podcast with P. Allen (is it "Periwinkle" or "Paul"?) and enlisted my help with taking some photos. 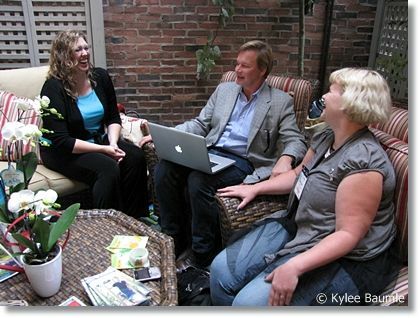 Hanging out with the original "Good Enough" girls, Jean Ann Van Krevelen and Amanda Thomsen. 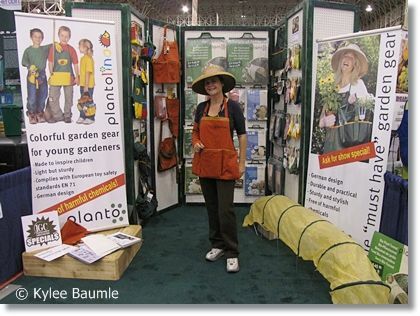 After eating our free pieces of pizza, kindly provided by P. Allen's Garden Cafe, we went back out to the rest of the show, where we continued to look around at all the wonderful gardening products. 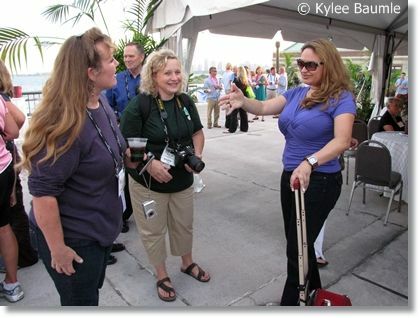 We ran into Linda Tyson (Garden Girl), who joined us for the fun afternoon. As the afternoon went on, we found more friends and acquaintances in attendance, which just made the entire show that much more enjoyable. 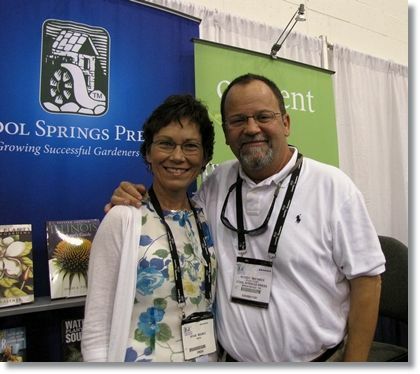 It was good to meet more of the Your Garden Show people, including owners, Tom and Lisa Finerty. 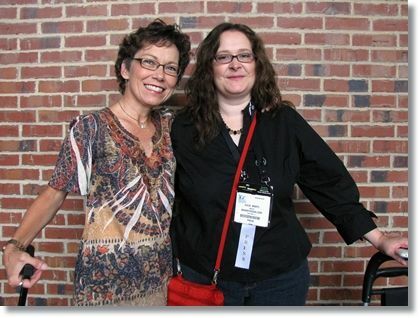 We'd met Kristen at Buffa10. Funny, we fellow Buckeyes had to go to Chicago to finally meet each other! At the end of the second day, Shirley's crew filmed the three of us chatting with her about the products we each had chosen. Our segment will air soon on Shirley's show. I'll post a link to it when it does. 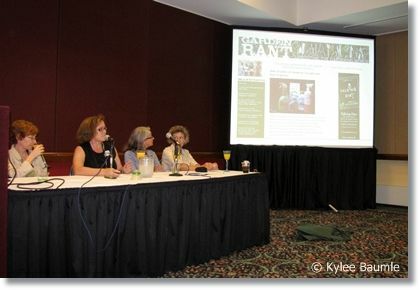 On Thursday, the final day, we attended the seminar presented by the Garden Rant women - Amy Stewart, Elizabeth Licata, Michele Owens, and Susan Harris. Very, very enjoyable and enlightening, but then, they always are! 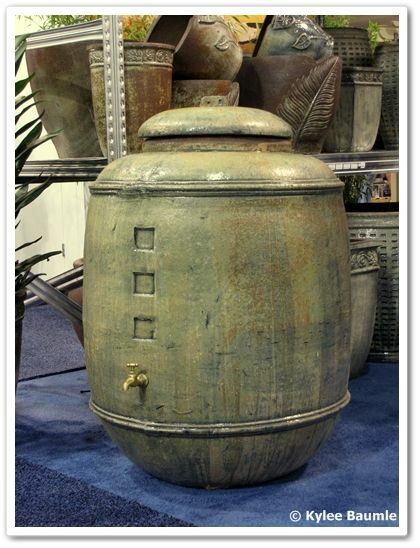 Now that's the way to do a rain barrel! 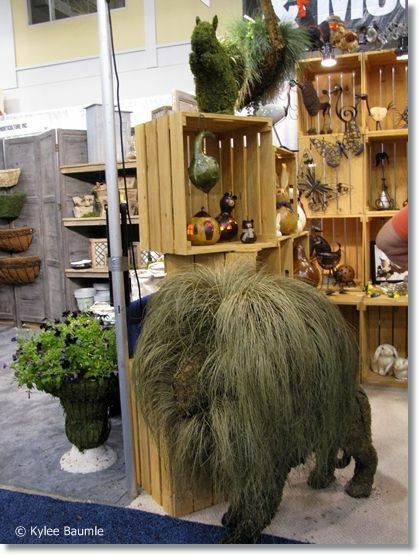 How cool is this lion topiary? 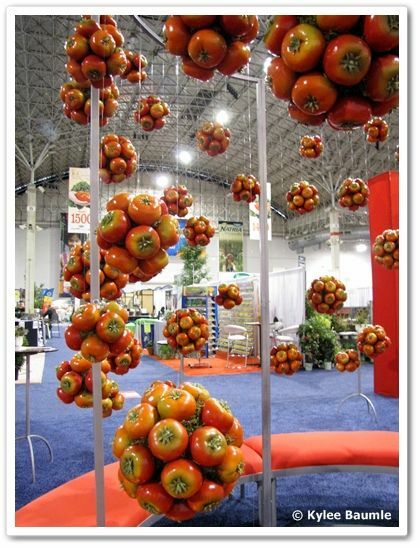 There were a lot of seed companies present, including Livingston Seed Company, whose display is shown here. Wednesday evening, there was a Margaritaville Rooftop Party, where attendees could be seen eating and drinking (mostly drinking) and schmoozing with the cool garden people. 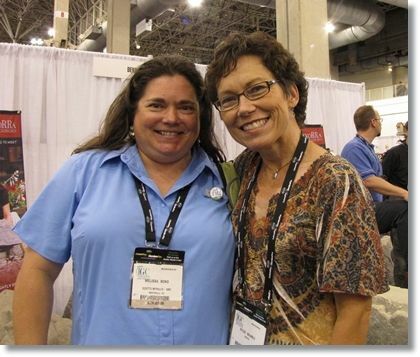 Arlena Schott (Garden Wise) and Brenda Haas (BGgarden) relax after a busy day, along with Shirley Bovshow (Garden World Report). Bren spent the entire three days shooting photos for Shirley. They were busy little bees! 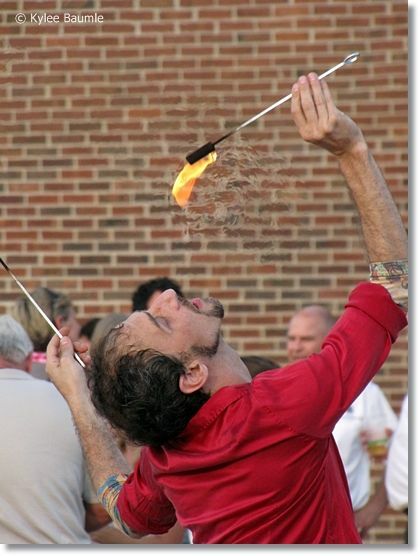 The flame eater was part of the Margaritaville entertainment. My rolling cart proved to be a real back saver for transporting goodies from the show back to the hotel. 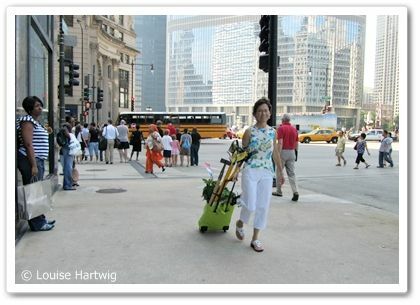 It's probably not every day that you see hoes and hydrangeas rolling down the sidewalks of Michigan Avenue. 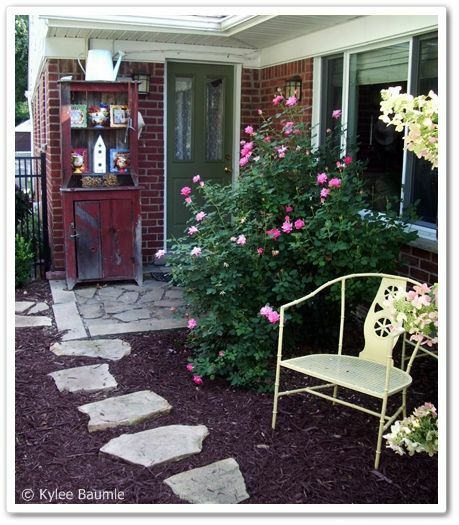 So which two products did I choose to highlight for the Garden World Report? 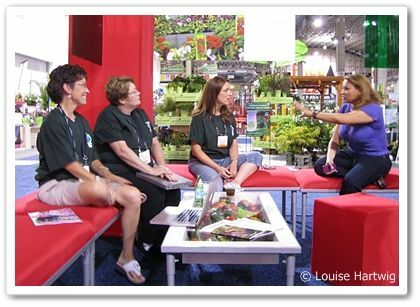 Live taping of Garden World Report with host Shirley Bovshow and fellow garden bloggers, Mary Ann Newcomer (Gardens of the Wild, Wild West) and Shawna Coronado (The Casual Gardener). It's not available on their website just yet, but you can read my review of the original Seed Keeper Kit here. 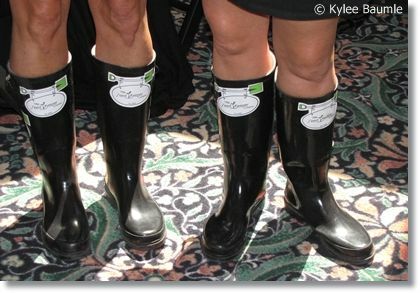 Don't you just love their boots? The other product, which I failed to get a photo of, is the fruit pocket, by Planto, of Germany. Made of canvas, it hangs around your neck, has a folded up pocket in the front, in which you put fruits or vegetables that you've collected in the garden. You can carry them in this, hands-free, until you're ready to go in the house with your bounty. When you're ready to empty the pocket, simply release the hooks on each side and they come out a fabric chute at the bottom. Very clever! It's not shown yet on their website either, but it's hanging on the display just to the left of Fredericka's pocketed hand. Chicago and the show were fabulous, even more than we anticipated. 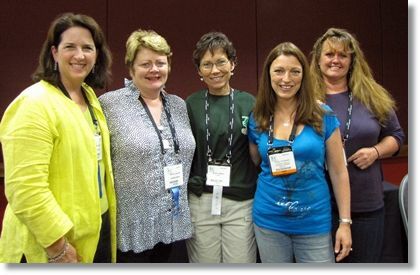 I'm grateful to be a member of the press (GWA) that allowed me to attend the show and see all the wonderful new things the vendors have in store for the gardening world. 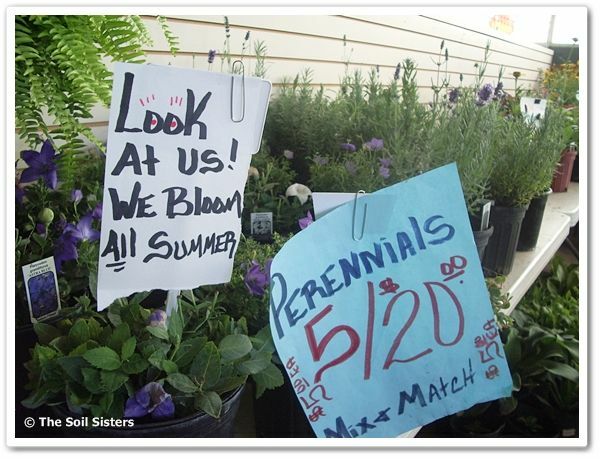 There are some exciting things coming to an Independent Garden Center near you! 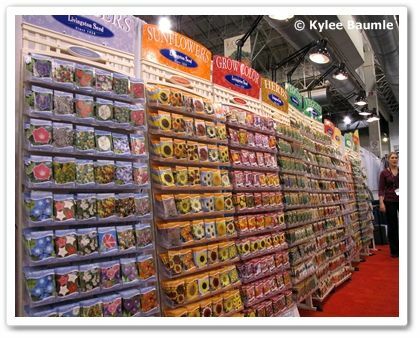 I'll be reviewing several of the products I picked up at the show in the coming weeks, so stay tuned!